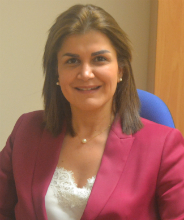 Maya Farah is an Associate Professor of Marketing and chair of the Hospitality Management and Marketing Department.She holds a Ph.D. in Marketing from the University of Manchester, and an MBA along with a BSc in Banking and Finance from the Lebanese American University. Maya has several years of undergraduate, graduate and executive teaching experience at several AACSB accredited universities, including the American University of Beirut and the Ecole Supérieure de Commerce in Toulouse – France. She has published several papers in top-ranked academic journals in the field of omnichannel marketing, online communities, and technological innovations’ effects on the consumer journey. Moreover, through the application of well-established socio-cognitive theories, she has widely published in the field of consumer boycotting and switching behavior, Islamic marketing, and financial marketing.She also serves on the editorial board of the International Journal of Bank Marketing and acts as a reviewer for numerous refereed journals and renowned marketing conferences. Farah, M. F., and El Samad, L. (2015). The influence of gender on the assessment of controversial products’ advertisement in Lebanon. Advertising and Society Review, 16(2). Farah, M. F., and Ramadan, Z. (2017, December 14 – 16). The consumer’s journey in the era of the “First Moment of Truth 2.0”, 43rd European International Business Academy Conference (EIBA 2017). Milan: Italy. Farah, M. F., and Ramadan, Z. (2017, October 26 – 29). The Rise of the Impulsive Shopper: The Case of the Amazon Dash Button. Association for Consumer Research North American Conference. San Diego: United States. Farah, M. F., and Mehdi, N. (2017, June 1 – 4). Consumer ethnocentrism and consumer animosity: A literature review. Proceedings of the 2017 Conference on Historical Analysis and Research in Marketing (CHARM 2017). Liverpool: United Kingdom. Farah, M. F., and El Samad, L. (2017, January 26 – 28), Consumer perception of Halal products in a developing country setting: An empirical assessment amongst Sunni versus Shiite Muslim consumers. Proceedings of the 16th International Marketing Trends Conference (IMTC 2017). Madrid: Spain . Ramadan, Z., Mrad, M. and Farah, M. F. (2015, October 28 – 31). A Contemporary Challenge in the Globalization of Service Technology; Moving from Self-Service Technologies to Drone-Delivery Interfaces. Proceedings of the EAMSA: Theory and Practice in Bridging Europe and Asia: Contemporary Challenges in International Marketing. London: United Kingdom. Farah, M. F., and Fawaz, R. (2015, September 8 – 10). A cross-country study of the underlying values behind luxury consumption in the Arab World. Proceedings of the 29th British Academy of Management (BAM) Annual Conference. Portsmouth: United Kingdom. Farah, M. F. (2013, September 10 – 12). An Expectancy-Value Approach to the Study of Beliefs Underlying Consumer Boycott Intention. Proceedings of the 27th British Academy of Management (BAM) Annual Conference. Liverpool: United Kingdom. Ramadan, Z. and Farah, M.F. (2017). The Dawn of ‘Guerrilla Marketing’: The alteration of consumers’ attitudes towards retailers and their usage of various social media platforms. [Kindle Edition], Retrieved from Amazon.com. Cateora, P., Graham, J., Gilly, M., and Farah, M. F. (2013). International Marketing. McGraw-Hill Publishers, Middle East edition. Farah, M. F., (2011). The Arab Consumer Boycott of American Products: Motives and Intentions. In Handbook of Islamic Marketing, Sandıkcı, O. and Rice, G. (eds.). London: Edward Elgar Publishing Ltd.